… On 1/2 hours notice to shift. Finally moved at 2PM until 6 o’clock. Issued with 1 can of beer. Bedded down for night. Rain hard. Convoy moved out at 7.30AM. Travelled through terrible sand storm in which part of convoy got lost. Crossed border into Egypt. Halted at 5.45PM for night. Lost part pulled in during night. Moved on to rail head. Received first mail for over 7 weeks. Weather terribly cold. Caught train at 10AM. Horded in patrol wagons. Received great meal at 4PM. Reached Sidi Ammar at 7.30PM. Pitched camp on flat below escarpment. Sent cables to Mum & Marg. Rained all day. Very miserable. Spent most of day at YMCA. Still raining hard during day. Pictures given at night by S.A’s(?). 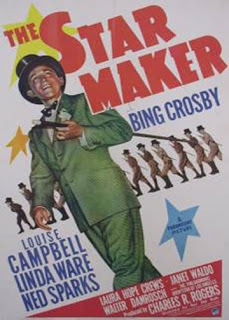 Bing Crosby in “Star Maker”. Weather cleared. Visted 24 Battalion. Heard sad news of Keith. Six Brigade suffered 75% casualties. Whole of Keith’s platoon wiped out at Sidi Rezegh(?). Early to bed. Note : Keith was my Grandfather’s brother – he was killed in action back in November. To read more about Keith, click here. Received letters from Mum & Marg about Keith. Spent day writing letters. During afternoon terrible sand storm blew up. All gear smothered with layer of dust which turned to mud when it rained later. Rained and blew all morning. Received parcels from home, Marg & Lyttelton. Saw R Seymour & B Lester in afternoon. Listened to news then to bed.